American conglomerate General Electric Company (GE) signed two separate memorandums of understanding (MoUs) on Wednesday for implementing several power and energy projects in Bangladesh worth US$ 7.4 billion. The projects include 6,000-megawatt (MW) liquefied natural gas (LNG) fired power plant at Moheshkhali in Cox's Bazar. 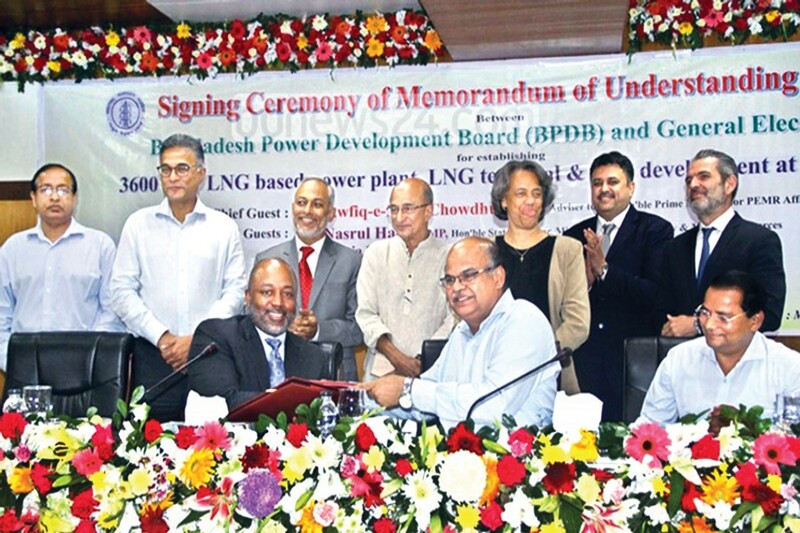 GE inked one MoU with the state-run Bangladesh Power Development Board (BPDB) for implementing projects worth $4.4 billion, including a 3,600-MW LNG-based power plant, an associated LNG import terminal, and necessary infrastructure under a joint venture (JV). It has inked the other MoU with local Summit and Japanese Mitsubishi Corporation for implementing projects worth $3.0 billion. On the other hand, BPDB will be the lead partner having 51 per cent equity, while GE will have 30 per cent equity. Prime Minister's Energy Adviser Dr Tawfiq-e-Elahi Chowdhury was the chief guest at both the MoU-signing ceremonies, held at Sonargaon Hotel and Bidyut Bhaban in the capital respectively. State Minister for the Ministry of Power, Energy and Mineral Resources Nasrul Hamid, and US Ambassador to Bangladesh Marcia Stephens Bloom Bernicat were the special guests at the functions. Speaking on the occasion, the PM's adviser lauded GE for being associated with the Bangladeshi companies to implement the power and energy projects. Mr Chowdhury urged the US company to establish a turbine manufacturing plant in the country, and help Bangladesh with innovative technologies to ensure sustainable energy at affordable cost. He also requested GE to consider establishing coal-fired power plants in Bangladesh to ensure diversification of energy and proper fuel-mix. Mr Chowdhury also requested the company to harness the human capital of Bangladesh, as the country has a number of qualified and sophisticated engineers and scientists. The state minister, in his speech, said Bangladesh will engage private sector in electricity transmission to meet the country's growing need. The country will also involve private sector in electricity distribution in future as part of its deregulation plan, he added. The US is the largest source of FDI, the largest consumer of Bangladeshi goods, and it is pleased to be associated with the country's progress, she noted. Summit Group Chairman Muhammed Aziz Khan said, "In support of the government's vision 2021 and 2030, Summit is partnering with GE and Mitsubishi to fetch the largest private FDI to Bangladesh, and the best technology at the world's lowest tariff to meet the increasing demand of people and businesses here for energy and power." "GE Power is navigating customers through an energy transformation with a complete portfolio of fuel choices and innovative technology," said GE Power President and Chief Executive Officer (CEO) Russell Stokes. "In partnership with Summit Power, our technology enables unprecedented levels of efficiency to strengthen Bangladesh's power generation," he opined. Power Secretary Ahmad Kaikaus, BPDB Chairman Khaled Mahmood, Mitsubishi Corporation Senior Vice-President Tetsuji Nakagawa, and Summit Group Vice Chairman Latif Khan were also present at the MoU-signing ceremonies.